A lovely warm sunny day again on Sunday at Wetheral Cottages, so where fits the bill for today? We haven’t to be too late back as our grandson is with us and he is to return home. Lowther Park seems a good starting point and with the magnificence of the slightly dilapidated castle at one end, the park looked very medieval as we parked up near the church. We set off across the park admiring the avenue (of presently lifeless) trees leading up to the castle’s entrance, to join the River Lowther and followed this to the Gatehouse at Eamont Bridge. This was probably once the road used to the castle and after leaving the park it is lined with trees. There are many others using this route today but I’m sure had we been here at a quieter time, there would be plenty of Deer to see. However the Red Squirrels seem to be enjoying a break in their hibernation or are they out and about for the rest of the year? 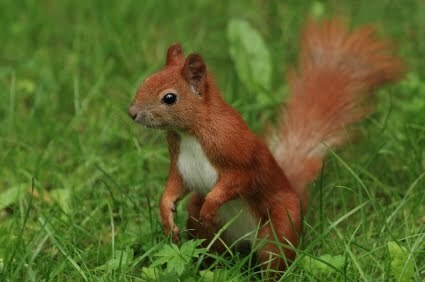 I had always believed that squirrels do hibernate but something made me use the power of Google to query this. It appears they have reduced activity but do not actually go to sleep as in true hibernation. The growing numbers of Squirrel around the Eden Valley must be in part due to the hard work put in by the local conservation groups. There is something much more appealing about the Red than the Grey, so it is hoped the good control measures used to keep the grey at bay can continue. We stopped at the point where the track and the river are crossed by the railway line a marvellous structure of six spans of sandstone construction, probably quarried from just beside the Lowther Viaduct. The railway is about 100 feet above the river and whilst it is not the longest bridge, locally, its height always impresses. If only travellers on the West Coast Mainline could appreciate what is under them. Passing the Gatehouse at Eamont Bridge our goal is off to the right, Brougham Hall and nestled within its walls Fusion Café, for a great cup of coffee and a large slice of cake. Brougham Hall once considered the “Windsor of the North” as King George VI visited it frequently with is father; the recent film “The Kings Speech” of course reflecting part of his life. Well worth looking round Brougham Hall and especially the Church or even walking the additional mile to Brougham Castle. The route was now across the fields to Clifton the site of the last battle on English soil, skirting Clifton Hall Farm, more ruins, this time Clifton Hall a Pele Tower. Crossing the M6 the route again goes under the railway line, this time the bridge is a modern concrete construction, spanning the road also, purely, it seems, designed out of practicality or purpose, rather than a pleasing structure as with the Lowther Viaduct passed under earlier. Heading back towards Lowther Park the fields are alive with lambs gambolling along the hedges and banks whilst the mothers enjoy a peaceful afternoon in the sun. Pheasants and Partridge seem to be flying around in pairs ready for another population explosion. More Squirrels as we near the Park but there ahead are two Red Deer enjoying their afternoon tea at the edge of the field but now their gone; leaping the hedge with ease back into the wood. Dropping down into Lowther Park to return to the car, you can just make out part of the famous gardens that are currently being restored and are due to open again towards the end of April. There are plans to restore the castle by turning it into a hotel, it will be a stunning location if all goes well. 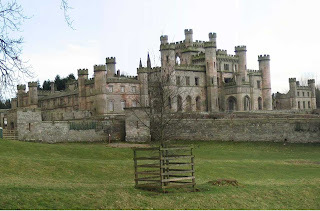 The 15th, to 18th of September sees the Lowther Estates as the venue for the 2011 International Sheepdog Trials (One Man and His Dog) and already some accommodation at Wetheral Cottages is reserved for those visiting this international event. To returm home we have to pass the Abbotts Lodge Ice Cream Farm so we just had to turn in! !